Used to see a black 300c in Dunstable/Luton/Bedford A5 area, but spotted a black Mustang that I think was wearing the old 300C plates? What these ones? LOL (Taken when I was swapping the plates over). I sold the 300C last year and replaced it with a Roush Mustang, where you seen me? Was a few weeks ago in Dunstable, I drive through in my lorry. You looked to have a lad in a suit in the car, I also went and bought a Mustang, I bought a Boss 302 two years back, but I kept the 300C. ! The garage I bought the Boss from had a blue Roush just in from the states at the time. I'll give you a toot if I see you again ! Last edited by steelblue300c; 08-18-2016 at 11:50 PM. 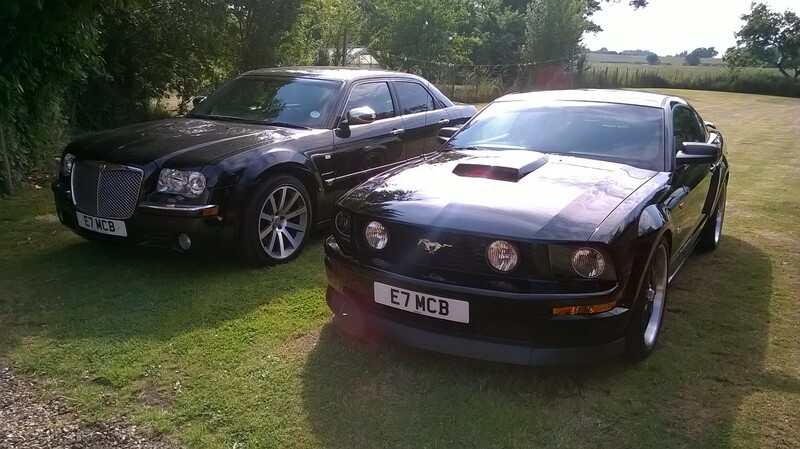 I'd had the 300c Hemi for 7 years and fancied a changed and saw the Mustang at an American Car Show in Billing Northants and had to buy it. Couldn't afford to run two gas guzzling V8's so let the 300c go and bought a L200 pickup instead as a daily driver. Do miss that Hemi tho for the pure comfort but as you know the Mustangs do draw a crowd! Defo give me a hoot next time !! Last edited by E7 MCB; 08-19-2016 at 02:10 AM.